Cocoa Butter Benefits and Homemade Recipes! Discover cocoa butter benefits for skin! Find DIY homemade recipes: natural goat milk soap, lotion, lip balm, lip gloss and whipped body butter! Soothe burned, chapped, itchy or dry cracked skin. Moisturize! Improve skin elasticity! Some claim it helps fade scars and stretch marks! Its natural antioxidants combat, damaging, free radicals! It has more antioxidants than blueberries and other super foods! Cocoa butter is a stable vegetable fat extracted from cocoa beans. Almost everyone has eaten it in their lifetime. It’s a major ingredient in white, milk and dark chocolates. It’s also used in ointments, lotions, soaps, salves, creams, cosmetics and pharmaceuticals. It's pale yellow in color with a chocolate scent. It has a storage life of 2 to 5 years! The cocoa tree, Theobroma cacao, is a small evergreen tree with small clusters of pink flowers and long, broad, leaves. Cocoa trees are native to the deep tropical regions of Central and South America. 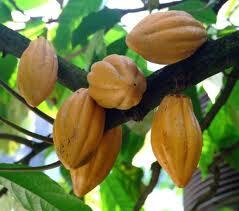 Almost 70% of the world’s cocoa crop grows in West Africa. 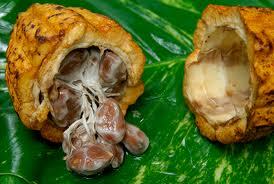 Cocoa pods are the fruit of the tree. Pods are oval shaped with a rough, leathery, texture. Inside are large seeds, white to pale lavender in color, covered in sweet pulp. Harvesting the pods is labor intensive. Ripe pods are collected then carefully split open. The seeds, (beans), are removed in preparation for a two part curing process of fermenting and drying. Beans are sorted, cleaned and inspected. During fermentation, the chocolate aroma and color develop. Beans are either sun dried or artificially dried. Dried beans are cracked open, separating the shell from the nib. Nibs are roasted to a rich, dark brown, color. Roasted nibs are ground in stone mills to a thick, chocolate, liquid known as “mass”. Cocoa mass is pressed in powerful machines to extract cocoa butter. Organic cocoa butter is not refined, has no added chemicals, no artificial colors or scents and is gluten-free. Vital enzymes and nutrients are preserved. Natural healing properties remain. 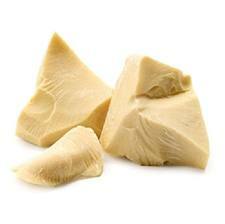 Unrefined cocoa butter is pure, with no additives, creamy yellow in color. It retains its vitamins, minerals, phytonutrients and fatty acids. This cold pressed butter is not deodorized and smells like milk chocolate. Refined cocoa butter has its chocolate scent and color stripped away, in processing. It’s white in color with little chocolate aroma. It's easier to blend into various cosmetic formulations, since most of it’s chocolate scent and color are removed. Some claim that during the refining process the “good things” of cocoa butter are stripped away too. The natural antioxidants in cocoa butter help prevent rancidity, allowing a shelf life from 2 to 5 years! Keep it in an air tight container in a dry, cool, location. It’s solid at room temperature, but with a low melting point it changes to liquid quickly. It can be store in the refrigerator, if desired. Apply cocoa butter to dry cracked skin. Add it to a warm, steamy, bath with coconut oil. Use it to make lotions, creams, lip balms, soaps, body butter or more! It adds a rich, creamy, texture with healing properties. SOOTHE and MOISTURIZE: Cocoa butter penetrates skin, providing nourishment. Soothe sunburns, wind burns, dry cracked skin and chapped lips. It’s gentle, enough, for sensitive skin. ANTI-AGING: Cocoa butter has antioxidants that combat damaging free radicals. Free radicals cause skin to look aged by breaking down collagen and reducing oxygen levels in cells. Free radicals cause skin to have a dull complexion. They can cause wrinkles, fine lines, sagging skin, pre-cancerous or cancerous skin lesions. Cocoa butter improves the overall appearance of skin. Skin looks more supple and elasticity will improve. DIMINISH MARKS: Some claim cocoa butter fades stretch marks and scars when used overtime, but there’s no scientific proof or guarantee. HOW TO MAKE BODY BUTTER AT HOME!